Former Black Ops agent Robert “Cody” Snodgres claims that the CIA offered him $1 million dollars to bomb the Oklahoma City building in the early 90’s. According to reports, Snodgres was offered the vast sum of money to bomb the Alfred P. Murrah Building in Oklahoma City prior to the deadly explosion in the 1990s, and hours later was in a serious car accident when he refused the offer. Activistpost.com reports: The 1990s’ 9/11, so to speak, where evidence doesn’t add up was originally and officially blamed on fertilizer bombs perpetrated by Timothy McVeigh and his accomplice Terry L. Nichols. It’s a weaved web of deceit; the investigation was a cover-up in every sense of the word, and may finally get wings for exposure. Snodgres appeared on Jeff Rense’s radio show on December 4th and 5th, giving his shocking testimony stating he refused the offer to blow up the Alfred P. Murrah Federal Building. Ironically, hours after Snodgres did the December 5th interview he was in a near-fatal car accident. Snodgres left an audio message after the crash with further details on the incident. This wouldn’t be the first time that someone connected to OKC or looking into it had an accident. Several mysterious torturous deaths followed others in the story of the Oklahoma City bombing, something that has the markings of a deep state black intelligence operation (false flag attack). Terrance Yeakey was one of the first responders at the scene after the OKC incident and may have seen the explosive devices that the news reported that day. Terrance Yeakey’s ex-wife Tonia stated on radio program AM1300 KAKC in 1998 that her husband was killed, with his death framed to look like a suicide only days before receiving the police department’s Medal of Valor for his heroic rescue efforts that day. On May 11, 1996, only days after Yeakey’s death, the New York Times ran a story with the headline – “A Policeman Who Rescued 4 in Bombing Kills Himself.” But the bold assertion that Sgt. Terrance Yeakey killed himself couldn’t be further from the actual truth. Tonia Yeakey, alleges that her husband witnessed things during his response to the bombing which did not agree with the ‘official version’ of events being put forward by law enforcement and the mainstream media at that time, and he began collecting evidence to support his findings when he was brutally murdered. Another man who had an untimely death is Kenneth Trentadue who was being held in a suicide-proof cell when he suddenly committed “suicide” by hanging. Timothy McVeigh stated that he believed Trentadue was mistaken for Richard Lee Guthrie Jr., a suspected co-conspirator in the bombing who was also found dead from hanging. Guthrie was a member of the Midwest bank robbery gang. But the mysterious hanging deaths don’t end there. A third person, witness Alden Gillis Baker, a month before the trial was to start in 2000, was also found hanging in his cell. Then there is the death of videographer Norman Perle who suddenly had a heart attack a month after telling Kenneth Trentadue’s brother Jesse that surveillance tapes had been erased. Terry Nichols, like Robert Snodgres, stated a similar shocking allegation in a 19-page signed declaration asserting that the whole bombing plot was an FBI operation and that McVeigh let it slip during a spout of anger that he was taking instruction from former FBI official Larry Potts. Potts was the lead FBI agent at Idaho, Ruby Ridge in 1992, which led to the shooting death of Vicki Weaver, the wife of separatist Randy Weaver. He was also reportedly involved in the 51-day siege in Waco, Texas in 1993, which resulted in a fire that killed 81 Branch Davidian followers. In 1995, one month after the Oklahoma City Bombing, Potts was promoted to the bureau’s Deputy Director by then FBI Director Louis J. Freeh. Potts was then demoted months later in July, 1995 after there was intense pressure and criticism for the cover-up of an order to allow agents to shoot anyone seen leaving the Weaver cabin at Ruby Ridge. It was also alleged that he had helped destroy documents, according to the New York Times. So Potts very well could have had a hand in the OKC bombing whether deliberately or as an entrapment operation gone horribly wrong. Although the claims by Snodgres don’t mention Potts, he did mention that he was set up to be a patsy himself. After that accusation by Nichols was made public by Jesse Trentadue, former FBI Terrorist Task Force director Danny Coulson called to reopen the investigation and named German intelligence agent Andreas Strassmeier as potentially involved, BBC reported. Interestingly, Timothy McVeigh worked for the CIA as a drug smuggler and assassin prior to deciding to blow up the Murrah Building. So, to say the least, he was very connected to military intelligence like Snodgres. In a letter to his sister in the New York Times that is often overlooked, McVeigh mentions the covert operations that he was a part of. Later in 2010, it was found that the CIA collaborated with the U.S. Justice Department in the prosecution of convicted Oklahoma City bomber Timothy McVeigh after Jesse Trentadue sued the CIA with a FOIA request trying to get information on his brother’s death. He received 37 blank pages, 12 documents altogether, all stamped Secret, or National Security, Antiwar reported. 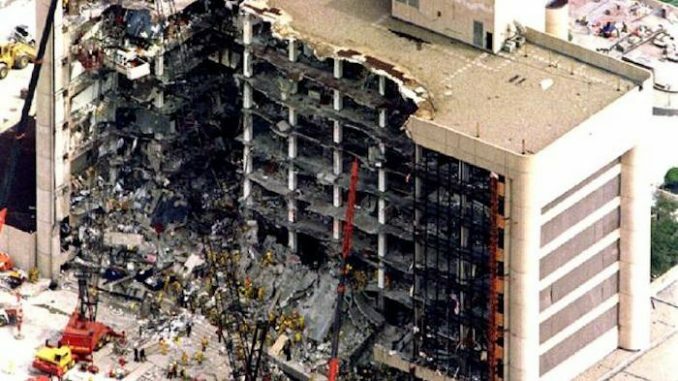 Further, other documents released under the Freedom of Information Act later confirmed that the FBI received a phone call the day before the Oklahoma City bombing warning that the attack was imminent, and that the feds tried to reach a deal with bomber Terry Nichols to take the death penalty off the table if he admitted making the call. It is factually documentable that the CIA or elements (deep state) have planned several false flag attacks throughout history at the peril of the American people, most notably the infamous Gulf Of Tonkin incident, falsified evidence of WMDs and Operation Northwoods. But recently it was also disclosed through the National Archive JFK files that the CIA suggested a third false flag attack, this time blaming the Soviets to start a war with Russia, Newsweek reported. Additionally, there is the fact that majority of terrorist plots including the first bombing of the World Trade Center were set up by the FBI to either get information out of someone or to ensure job security by stopping terrorist plots planned by the FBI, as this New York Times article documents. So was the bombing of the Murrah Building, which injured 700 people and killed 168, including 19 children, also a false flag attack against the American people as former FBI LA Head Ted L. Gunderson suggested? According to Gunderson in his speech, he said that CIA Michael Riconisuto examined seismic graphs and found that it was an advanced bomb and not homemade. The Oklahoma City Police Department reported 324 buildings damaged including 10 structures collapsed and 13 condemned, 86 cars burned or destroyed, and an estimated 50,000 people evacuated from the downtown area. Gunderson wasn’t the only government official to challenge the official narrative of the Oklahoma City federal building bombing. In the 1990s a U.S. Airforce Brigadier General K. Partin also expressed that the facts didn’t add up surrounding the building’s explosion. Partin revealed in a scientific analysis that core columns were blown out from within the building and the extensive damage to the Alfred P. Murrah Building was completely inconsistent with the explanation of a truck filled with fertilizer bombs. Snodgres said he waited for Hillary Clinton to be removed from U.S. politics before coming forward with the shocking allegations. Today, the Oklahoma City National Memorial stands where the Alfred P. Murrah Federal Building once stood. The memorial includes 168 empty chairs made of glass, bronze, and stone, each inscribed with the names of the people killed on April 19, 1995. Were Ancient Gods Actually Extraterrestrial Beings?